The European Circle of Philanthropists of Opera and Ballet is a non-profit organisation that was created in Paris in January 2014 under presidency of Jérôme-François Zieseniss, paying tribute to Rolf Liebermann. Committed to supporting and contributing to the future of opera and ballet, nurturing the renewal of these art forms is our mission. We dedicate our passion and energy to assemble opera and ballet enthusiasts, sharing the same vision of excellence. 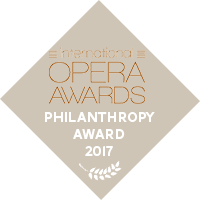 Over the past three years we have federated 79 opera houses, festivals, ballet companies and friends associations as well as individual and corporate members in 20 countries and have raised funds to support innovation, creativity and emerging artists in the field of opera and ballet through the FEDORA Prizes.